As a child, and in fact as an adult, my vacation time has been largely spent camping in a field in Cornwall. (A really lovely field, in a really lovely location, with really lovely people may I add!) It’s a well-known mythical fact that England is a country accursed with rain, those from the UK will relate when I say that the Westcountry, and particularly Cornwall is renowned for it’s glorious coastlines, it’s heritage and it’s unstoppable, torrential rain. So, as a child (and yes I still do this now) I’d spend a lot of my time sitting on a wet, drizzly beach – catching the sun whenever it peered out from under it’s strangely comforting bed of clouds. The rain never used to bother me – it still doesn’t really, in my opinion if you’re going to the beach you’re gunna get wet anyway. I mean you’d be a magician if you somehow managed to embark out of the sea without a single drop of salt water, absolutely knackered from the waves and shuffling along the shallow breaking waves in order to avoid stepping on a terrifying, fear-evoking, horrendously painful weeverfish. (I’m exaggerating a little but I’m really enjoying writing this haha). Anyway, in Cornwall rain is pretty much the weather forecast during the high-season summer weeks of late July to early August, and somehow as soon as the season finishes Cornwall is basked in glorious, heartbreaking sunshine. So… I’ve grown accustomed to Cornwall’s weather and have turned into something of a sun-chaser… I have a fortunate talent of finding sun in Cornwall when it’s raining everywhere else. (Or, at least I’m just lucky, but it allows me to be a little smug when you return back to the campsite to find your fellow campers are more than acquainted with the sound of rain hammering against their tents). (I really sound awful here haha, but after 22 years of camping in Cornwall I’m allowed!) Cornwall is lovely, yeah there’s a lot of rain, but that’s the price you pay if you decide to holiday in England, and in my opinion you’d be stupid to miss out on the wonders of Cornwall. Anyway, Cornwall seems to be the place where most of my hobbies have developed. As a child during my summers I was OBSESSED with diabolo, card games, wordsearches, cross-stitch, reading, feeding seagulls (oops) and Sudoku. I loved Sudoku, and for some reason I loved it even more when I was in a car travelling to some rainy harbour or beach. All these activities I’d stop doing though when I returned back to Essex – they seemed to only be things I could do on holiday. But, Sudoku has always been something that I’ve enjoyed, and recently I redeveloped my fondness (but unfortunately not my skill) for Sudoku. And it got me thinking, and I’m fairly sure it’s something which has been explored before but, does Sudoku – and any other type of puzzle – have a positive impact on your mental wellbeing? Without doing any fancy research or anything I’d quite happily say yes, it does. For me Sudoku gives me something to do to pass time, it’s also productive, it requires my attention, it engages my brain and allows me to tackle challenging puzzles. In an almost romantic way Sudoku allows me to escape from everyday stresses and even the constant exhausting pull of mental illness. 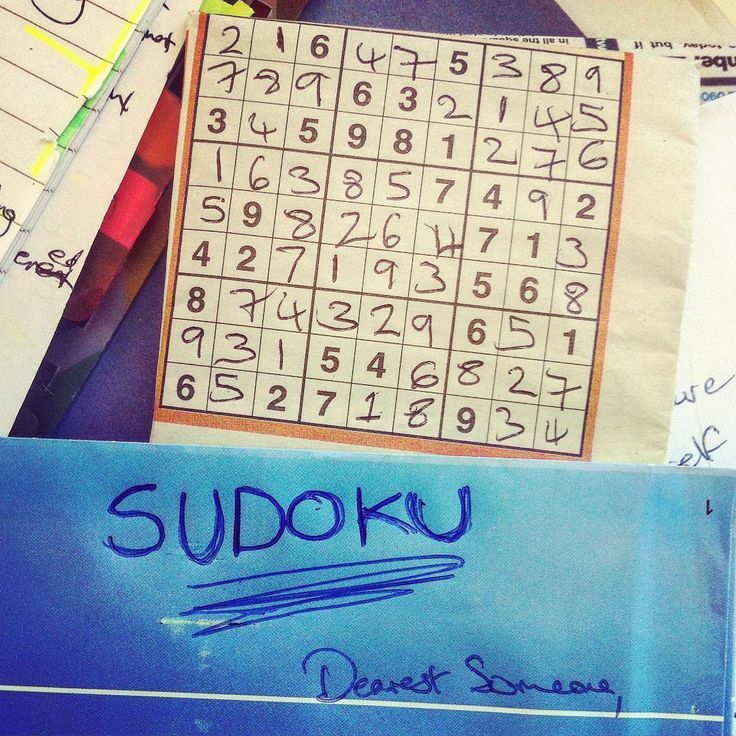 Now, to add information from research – research from various places – according to some it is a fact that Sudoku stimulates the brain, and moreover – incorporating puzzles such as Sudoku into your life, frequently of course, has beneficial effects on cognitive function and can even lead to modest delay in the onset of dementia and Alzheimer’s disease. (Read more about this here). Sudoku is a bloody brilliant coping strategy and I’d recommend it to anyone. I’d also recommend Cornwall – Cornwall is ace. You are so right about the west country and rain!! It rains so much here it is far from funny! I love Sudoku, but I can start getting really obsessive to the point I get angry and frustrated with it so I have to control my time with it quite strictly, actually with anything like that, I can snap from relaxed to frustrated so easily, just by spending a little too long on it, struggling to solve a puzzle I know I should be able to solve and so on. It can be quite the dilemma! Oh my I am EXACTLY the same haha! I get really annoyed when I’m finding an ‘easy level’ one difficult haha, and that’s when I realise I should maybe take a break haha!